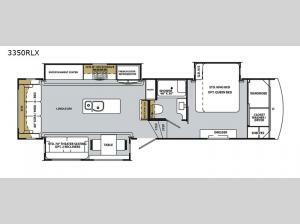 Plan to camp in luxury with this 3350RLX Cardinal Luxury fifth wheel by Forest River. Meal prep will be a breeze thanks to the stainless steel residential refrigerator, the kitchen island with a double sink and a high rise single handle pull-down faucet. At night, you can either relax in the 70" theater seating or the 80" hide-a-bed sofa at the entertainment center or jump into the king bed with a Denver mattress and rest up for your next adventurous day. Inside the front private bedroom there is also a wardrobe, shelves, a dresser, and a closet that is prepped to add the optional washer/dryer, plus there is even a 32" LED HDTV. Either way, you are sure to enjoy your camping experience in this fifth wheel!